Crime fuels massive insurance rises | What Car? More than 80% of motorists are paying more for their car insurance this year than last according to a What Car? poll - with rising fraud and criminal activity largely to blame. While the average price rise is 33%, more than half of motorists are facing bills that have soared even more according to What Car? research. This is despite the growth of online comparison sites which should, in theory, make it easier for motorists to shop around for better deals. Our research revealed a 25-year-old man whose premium has risen 77% to 1520 more than his Skoda Fabia is worth, and an 18-year-old girl who has been asked to pay 4250 for her Ford Fiesta, a hike of 52% over her premium last year. Neither driver had made a claim in the past 12 months. The Association of British Insurers (ABI) says the vastly increased premiums are down to three main causes: uninsured drivers (who add on average 30 a year to a policy), fraudulent claims (41 a year) and legal fees incurred in settling personal injury claims (41 a year). While all three issues are the subject of increasing legislation and government enquiry, What Car? is calling on the authorities to act faster and more efficiently so that innocent motorists dont have to keep on paying for criminal activity. 'We're in danger of getting caught in a Catch 22 situation, where insurance premiums rise as a result of insurance fraud, which in turn makes it more tempting to risk driving without insurance,' said What Car? magazine editor Jim Holder. 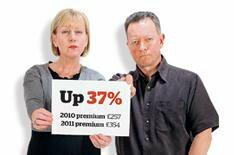 Has you insurance premium risen this year?